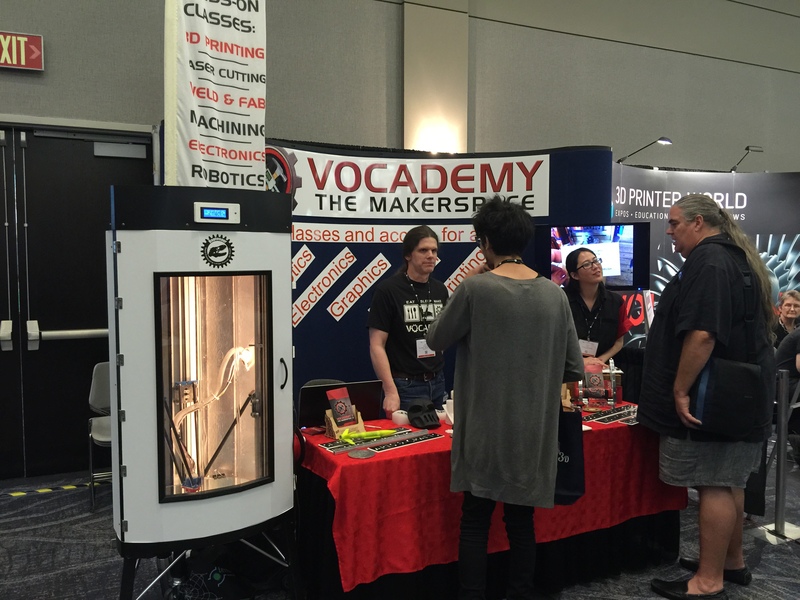 I was invited to show Raptosaur at the World 3D Printer Expo in Burbank with my MakerSpace: Vocademy, as an example of something built there. This was a very exciting experience. (I’m not in the photo above, taken at a quiet time). We were right next to the See Me CNC booth. We had a lot of interest, often with people 3-deep interested in the printer and Vocademy. I was very encouraged by comments from the other printer vendors. In order to get ready for this show, I installed a top surround made from thermoplastic that I bent using my plastic bender. I replaced the Rumba controller with a Smoothieboard, which is a 32-bit controller. This was the best thing ever, as the Smoothieboard runs much better and is easier to configure. Using the Smoothie I was able to finally get the auto-bed-leveling to work, to within 0.02mm which is about 0.0007 inches. I made a script that automatically extends the z-probe, probes the bed, and retracts the probe. 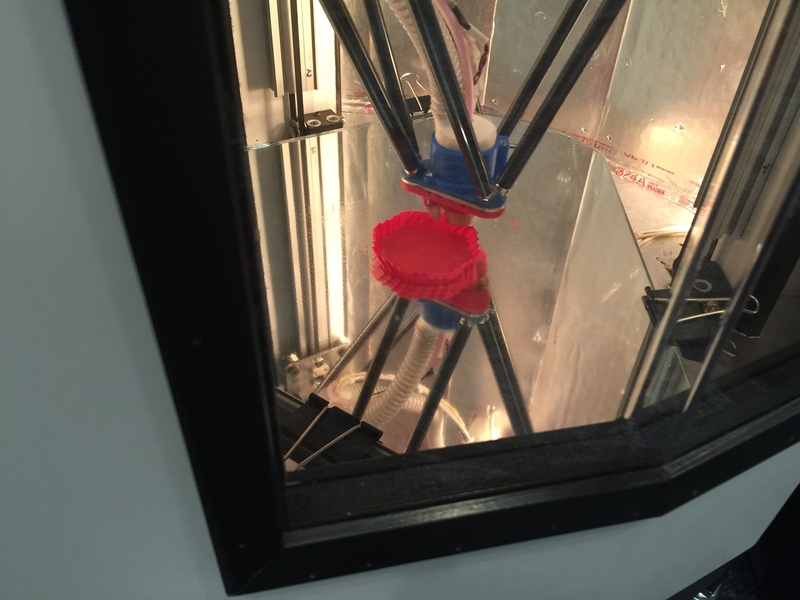 Having this working was a big relief, as it makes printing large objects possible – the first layer must be printed at a very precise height in order to stick to the bed properly. I had a piece of 3/16″ mirror glass cut to size for the print surface. Mirror was used because it is very flat, and it looks good too. I also had replaced the heavy black cooling hose with cpap hose and two printed adapters. 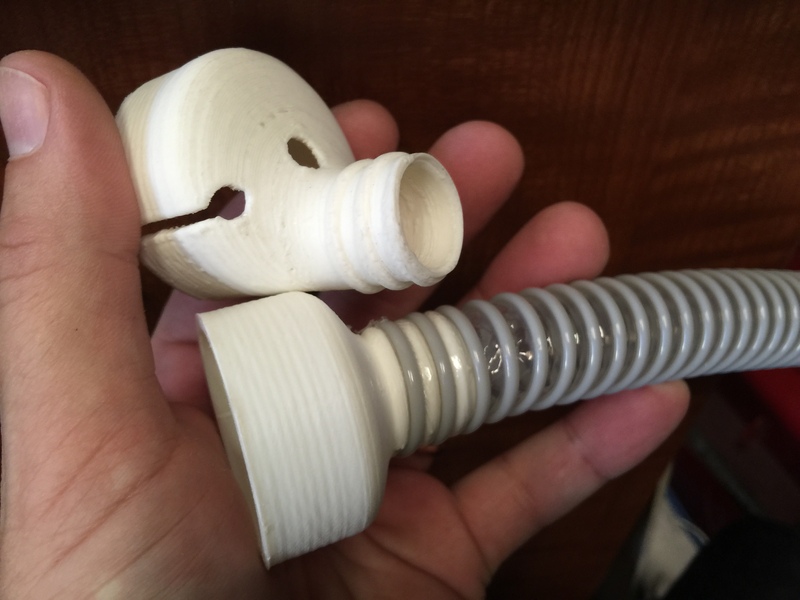 This tubing is used to blow cool air from outside the heated chamber to cool part of the hot-end, and also to cool the top of the printed part. This was much lighter, and allows the printer to move much faster. Another benefit was that I could remove the keychain keeper cable that I had used to hold up the heavy black hose. This was putting enough random torque on the effector that it was causing problems. We learned by testing at the show that it was extruding at a too low temperature. 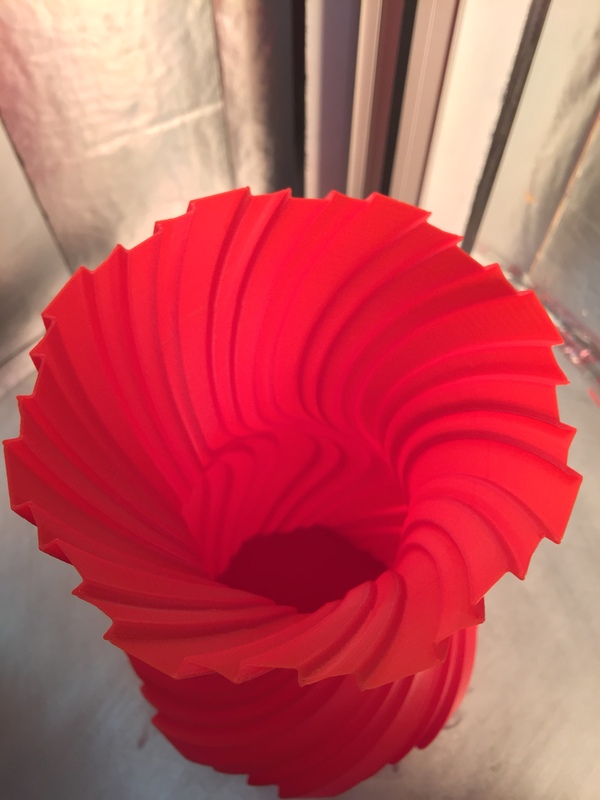 This causes the extrusion to be inconsistent (banding), causes printed corners to be pulled around, and causes the filament drive gear to clog with filament chips. It’s working much better now. 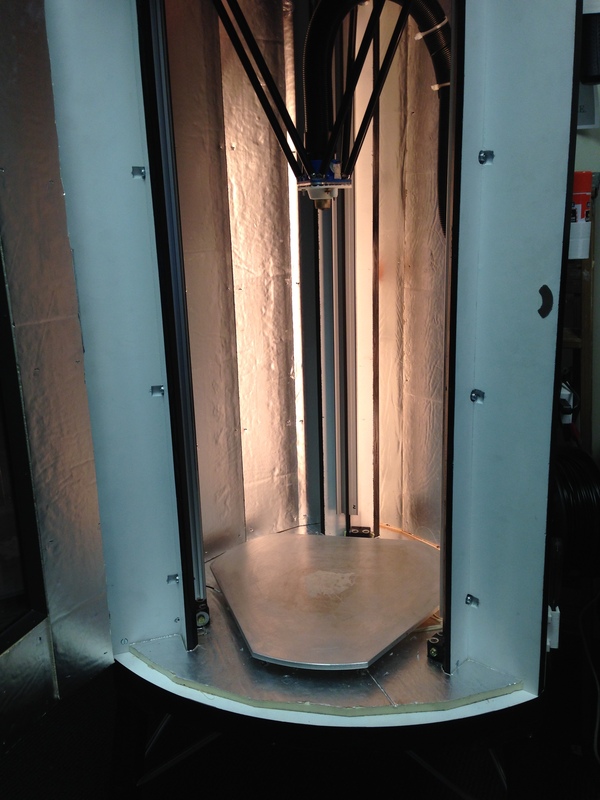 I have to balance the extrusion temperature with the cooling air blowing on the part – small parts can overheat more easily due to the heated chamber. I believe I can program the fan speed in Slic3r depending on the size of feature it’s printing. There was a lot of cool stuff at the show, I’ll post that separately. I’ve been finishing my new 3-D printer. A view Inside the enormous print area. Here is a link to a video of one of it’s first prints: Raptosaur. I was printing a leopard seal skull from digimorph.org at 30% scale, at the Mini Makerfaire at Vocademy in Riverside CA. When it’s calibrated I will be able to print this full scale. I want to provide full size fossil and animal skulls to local schools. Adjusted the accelerations to fix problems with missing steps. Upgraded to the latest Repetier firmware. Switched from Cura to Slic3r. Built new 1/2″ solid steel stepper motor mounts – these are much quieter! We built these at Vocademy. Built a control panel (version 1). Had an interview with a South Korean film crew, regarding entrepreneurs using maker spaces to jump start their businesses. 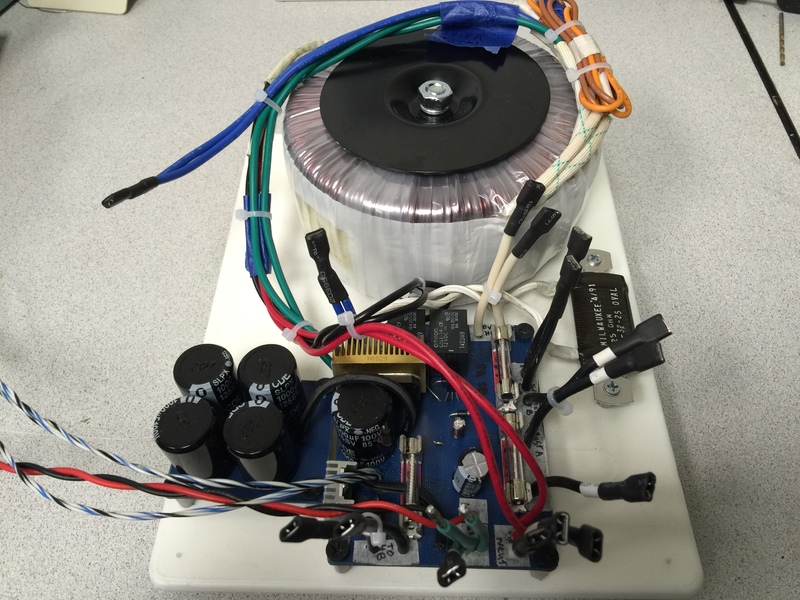 Installed the new power supply, new effector, tested scripts for deploying and retracting the Z-probe. I’m testing the bed leveling in Repetier. This is not going at all well at the moment, as the Repetier firmware 0.92 is hanging… That’s the last straw for the Rumba and Repetier, I’m going to upgrade immediately. Finish designing a 0.1 micron ULPA air filtration system that will catch the micro-particles that are emitted. Upgrade to a Smoothie Board – a 32-bit controller, and display. It’s on order, I can’t wait! Finish getting ready to show at the 3d Printer Expo at the end of January! 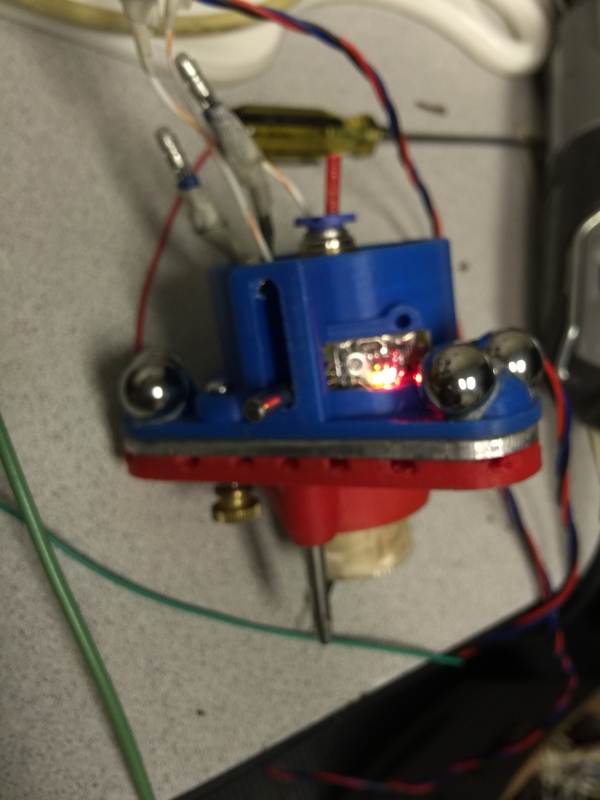 The tiny double-sided board is the hall-effect sensor board for the bed-probe (for auto leveling). The blue boards are for the heated bed power supply. 65v Heated Bed Power Supply with soft start. Effector assembly with Z probe. Sorry about the angle! 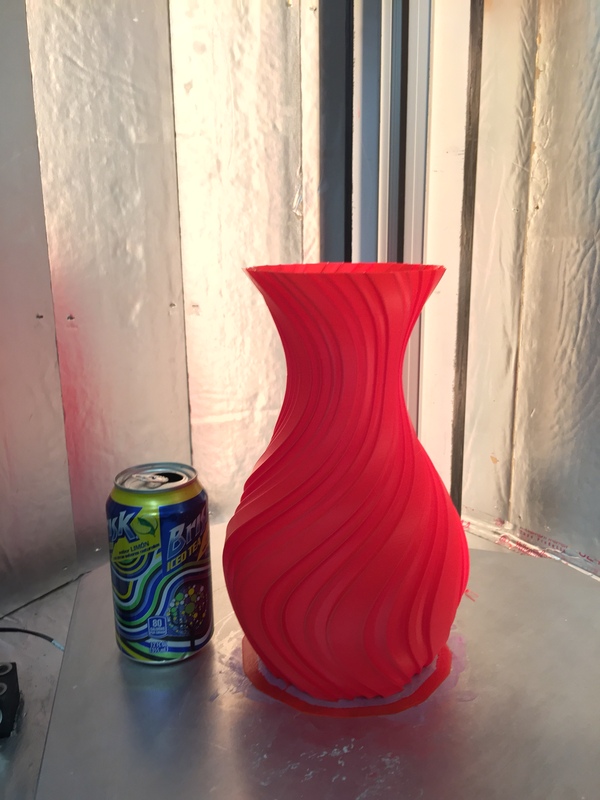 A vase I printed for the Korean documentary film crew. I have put this project on hold. I am working on a post-processor for Slic3r, and a calibration test generator suite for Guided Calibration. These together will make it possible to print much faster and more accurately. I love this program! After looking at many different CAD packages I decided on Alibre Design over a year ago – the Personal Edition was $100 then, and it’s more now. It has a very good sketch mode with parametric dimensioning that stays intimately connected to each object, and you can re-dimension at will. It was a bit of a learning curve, but there are a lot of vids that help a lot, and its well worth the time. I have added a page about How to make Dextrin coated paper for Toner Transfer. 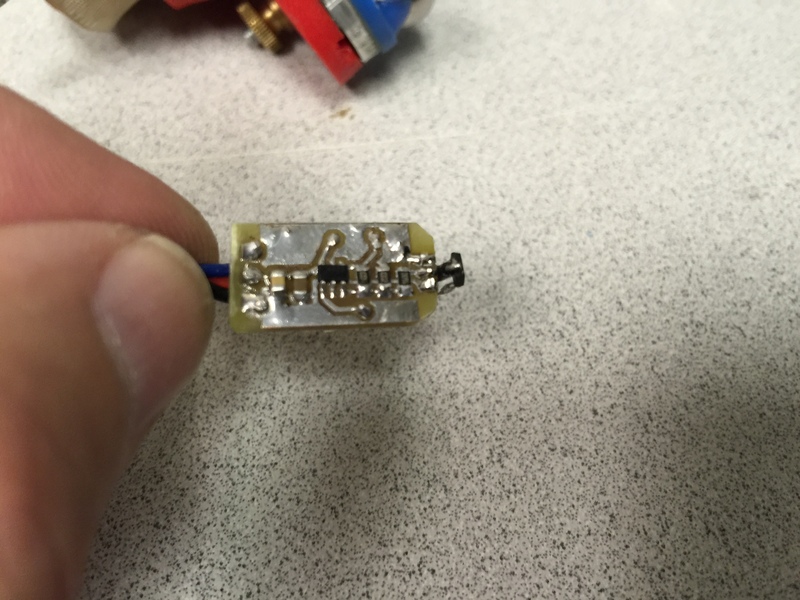 I have developed a method for easily and cheaply creating riveted Vias for circuit boards. A Via is a connection that goes from one side of a PCB to the other. There are times that you want to electrically or thermally connect the two sides of a board, and a regular commercial or soldered Via will not work – for instance a via in a home-made board may be under a chip and must be flush, or one is in a SMT pad and you don’t want the solder to wick down a via hole, or the via may need better thermal or current carrying capabilities. Here is the full article, now updated with more photos. Update: I am building a test board with 100 vias in series, and a Themal Cycling Test Rig to determine if thermal cycling will cause failures in these kind of copper via rivets in FR4. See above. I discuss my method of creating perfect single or double sided PCBs using the Toner Transfer Method. My prototype A3987 stepper motor controller (50v 1.5A) with riveted thermal vias, with added 1/2 current semi-sleep mode, and 8 status LEDs (my first SMT board so the soldering is not perfect).